This blog provides a simple template or example of a windows service which hosts a SignalR service. The Start and Stop methods used by the Windows Service use a long running Task which can be cancelled. SignalR is self hosted in OWIN. The main method of the service just starts the service. If you want to debug using a console application, just comment out the ServiceBase method and provide an command line argument. Install and uninstall batch files are provided for the application. These install and start the service or removes it from your computer. The path needs to be changed if you want to install it on your PC. Start the install script direct from your bin directory. 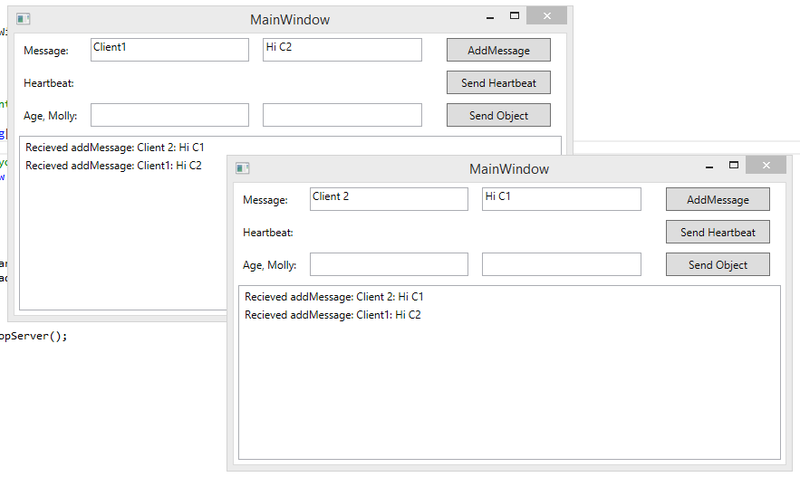 A Test WPF client has been provided to test the SignalR Hub in the service. Hi, is possible to self host one application with MVC and Web? You can host SignalR or Web API in any .NET application/process as it uses OWIN. The MVC application runs on IIS. So you could run MVC and SignalR together on the IIS, if you want. Thanks fot attention, there is no way to self host a MVC application? I have commented this out in the program.cs file. Then it will run as a service. Thanks for quick reply. Yes the service is started and running. The line “ServiceBase.Run(new SignalREngineServiceWindowsService());” is there also. The error is happening in the WPF client sample app. Looks like it cant see the service or something. Wondering if its firewalls, security or something machine specific. et’s say server is disconnected and then connected again, how to reconnect client to it? In signalRClientWPF i dont see any line does that. Hi Robert, sorry for slow answer, busy, the WPF client doesn’t have any exception handling implemented. hello ; thanks for your code , but with all the staff you say if you run netstat -anb there is not any port listening to specified port ! How to enable detailed tracing with owin self host?